With over 12 million people being subscribed to content from just the Top 100 charities in the report, I would definitely recommend a read of the full version as there are some great insights. Whether you work for a charity or within the digital sector, it highlights some of the pitfalls and successes any of us could learn from in making sure we all take a more integrated two-way approach to our digital communications (rather than just being solely digital broadcasters). Many of the charities surveyed are adjusting to the idea of being ‘digital be default’ and bringing digital to the top of their agenda. This is a significant shift in attitudes around how digital is handled and something that we also very much welcome. As a direct result of this, significant changes around a shift to earned media rather than paid for means that charities are looking to build and develop long-term relationships and their networks in order to build destination points for their followers and potential donors. The report states that user generated content is becoming more frequently used by charities and going way beyond blog comments to creating highly sharable and participatory content. However, only a fifth said that they are fostering this as an on-going way of working, maybe due to time or other budgetary demands. This I found particularly interesting as we see it a lot when we are developing campaigns for clients. Often we are approached to look at the strategy, messaging and design of a campaign which is fantastic but charities often miss the value of roll-out and the on-going management required for social media-based campaigns. This is a shame as post launch, keeping the momentum is paramount and you can see great campaigns flop and lesser versions trailblaze due to the conversations and management that are taking place. Building donations or social reach? As this years report was complied with JustGiving, it was interesting to see that only 9% of charities that scored well within the report, are recognised by Just Giving’s own Top 100. This suggests that in this environment, the smaller charities with tighter, more personal relationships are leading the way. I would also say it works with the principle of being truly accessible and having less bureaucracy. People buy from people, and having a close relationship with a smaller charity allows you to even have a cuppa with the CEO which surely can only help aid donations? So is there more that charities could be doing to help break this down, to become more human, more grassroots and ultimately possible back to where they used to be through social media? And thus, in some cases, feel less like a large, gregarious corporate and more of the friendly, independent grocer at the end of the road? The mantra of the report is very much forget ‘Facebook likes’ and think ‘formative movements’. Interestingly, most charities state the main reason for using social media in their strategies is for ‘growing brand awareness’ (22%), the next ‘developing dialogue’ (18%) but fiscal matters, such as, ‘increasing donations’ (10%), and ‘reducing costs’ (7%) feature at the bottom end of the scale. Surely, in our current times of austerity, this should be featuring higher up the scale when creating communication platforms with supporters and potential donors? People are becoming increasing well connected, the report states that over 12 million people like or follow the Top 100 charities. Clear winners in terms of choice of channels being used by charities are the obvious two – Facebook (64%) and Twitter (26%). Charities generally felt Facebook worked best for them in terms of driving website traffic whereas Twitter was regarding as being better for reaching potential visitors outside of their main network. Other break-outs such as, Google+ scored well for its hangout capability with charities such as Beat Bullying, but charities are becoming more adventurous with their channel choices using co-creation, apps, posterous etc. There is however, still some way to go with many charities who are not quite yet being fully integrated. Branding was also featured within the report citing large re-brands such as Cancer Research UK, Scope and Diabetes UK and their user-centred logos. Creating assets like these can really help to leverage social interactions, create dialogues and develop more integrated marketing approaches. It will be interesting to see what learnings – good and bad – the sector can take away from these brands. As we well know, the logo is only the tip of the iceberg, and it is how the brands come to life through their visual and verbal language that will see how these organisations can maximise on their bold moves within their social spaces. This is something of a mantra that we have internally and something the report also came back on. In terms of social leadership, the report highlighted that there was a general feeling that charities could work better to understand their audiences and thus deepen their connections. A lot of assumptions are often made about audiences and knowing behaviours, where people ‘hangout’ online. What really motivates somebody to make a donation or share cannot be underestimated. Whilst groups like 38 Degree have enjoyed some success over the years, this approach in itself is very much viewed by politicians (no matter how many thousand sign-ups) as just one count. So how can charities requiring actions go further? So who was the most social charity? Our congratulations go to Unicef UK, who were named No. 1 in the report, and to Laila Takeh (Unicef UK’s Head of Digital) and her team, who I was lucky enough to see speak at the at the Charity Comms event back in July. Even then, I was impressed with her tenacity and approach to ‘handling digital’ and the lengths they have gone to embed the culture into the everyday life of their organisation. It came as no surprise to me that they won as the work they have done is well deserved of this award. 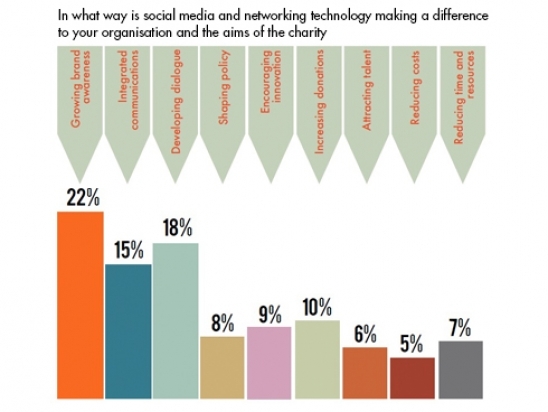 Image: In what way is social media and networking technology making a difference to your organisation and the aims of the charity? © 2012 Visceral Business Ltd.
As a participant in the Brighton Fuse research, I attended their Brighton Digital Festival event with much anticipation of what had been discovered.